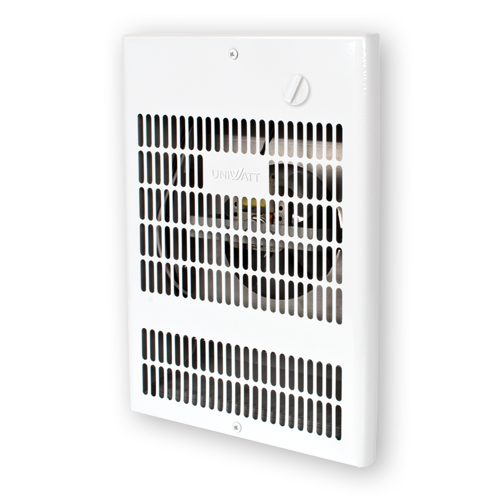 The Uniwatt UWH1002W is an in-wall heater that uses 1000W of power while taking up almost no space with its wall recessed installation. Equipped with a high-quality nichrome element, it’s capable of producing instant heat. It works by letting air in through the top of the grille located at the front and has warm air exit through the bottom. The heater’s fan helps then to circulate this warm air as quickly as possible, speeding up the process of warming up the room. A perfect solution for bathrooms, front entrances, basements, garages and workshops.Comes in a white epoxy-polyester powdercoat and 22-gauge steel cabinet.